This is how I've felt lately. Just ho-hum and not-so interesting. Cat's recent blog titled Uninspired kinda sums it up-except, I've had lots of things to inspire posts, just no motivation to blog. Ok, so maybe that's not very similar but she got a hyperlink;-). I'm irritated that not many played my "guess what the boys were eating contest". (Thanks to Lora (no blog) and Michelle for guessing;-). Just being honest. I'm apparently not very successful with blog games, but my blog's intent was never to illicit comments and guesses, I suppose. It was meant to convey info about our life changing pregnancy with Owen and then to update and inform about his health. And now, it's largely my "Digital Scrapbook" of sorts. So, I ask myself, "self, why do you get irritated when people don't comment or play along with your games"? I also ask myself, "self, why would you be less than inspired about Jake's first day of preschool a week ago that you didn't blog, or about TJ's hermit crabs changing shells, or Owen's crazy hair, or his MD appt update, or his horrendous diaper rash, or your current love for the college ministry you are volunteering in (the College ABF/PBF), or your Bible study starting back up soon (Heart to heart), or your sister's new puppies-Shnorky's (yes, a combo of yorkies and Schnauzers), or starting your new job and how you have been able to help out a little bit already, and so on"! "Seriously", self, "what's your problem?". About his hair-it's crazy. Naturally spiked. Cute as can be though:-) I wet it down, flatten it down and as soon as it dries-POP, straight up, finger in a light socket style. We've also been really struggling with diaper rash for over a week now. He did a trial couple days in daycare and they called me within the first couple hours to tell me his bottom was bleeding and is this normal...uh, no;-). So we have some really expensive Rx cream and have tried to let it air out as often as possible but he pees and poos sans diaper so with diaper (and rash we will go;-). He is talking like a magpie and so animated. He scrunches up his nose and says Noooooo a lot! He also sings and dances tons. He blows the BEST kisses with a real smooch sound and he still talks on the phone enough to need a headset to avoid neck damage;-). And not to cut this post short but it is getting late and this post has taken me 2 days to write it (sad-I know). Wish me well on my first day! I said I would share more about the hermit crabs TJ got recently when we visited my mom up North. Good news! They are still alive! I was a little worried as we got them from a mall kiosk thingy and the fella working gave my mom "a really good deal" (aka she was snowed). Before she knew it her little purchase of one hermit crab and a small shack turned into 2 crabs and a Crabby Mansion completely decked out with a climbing tree, duel shell feeding station, two addt'l shells for the crabs to "grow into" and more! It was a "really good deal";-). TJ was very grateful and has since had the crabs wake him up a few mornings (these dudes are active little fellas) by the clicking sound the gravel makes as they dig in it. He's also been pinched once by the bigger one Blueno (the little one is Louno-go figure:-). They are fascinating little creatures and we've had a lot of fun caring for them so far. If anyone has any tips or tricks, we are all ears. I have a few specific questions about them like: 1) can we change the gravel to sand? It seems like that would be quieter, and 2) can their water dish have water sitting in it or must the sponge be in there to keep them from drowning? Just wondering. My sister Heather thinks they look gross like big spiders but we disagree. her kids want them really bad-maybe I should get them for them for Christmas-he, he evil cackle...would serve her right for almost never reading this blog. Also, when we visited, my mom has a lady who does her nails and has done them since I was on bedrest and she became quite fond of Jacob when he stayed with mom for 2 months. Anyway, she was hoping to get to see him when we visited but we didn't make it in to visit. She had a special gift for Jake-a packers Jersey! So here are some cute pics of him showing off in his jersey. So this has a been a nice transition week so far. I got TJ off to school on Tuesday as I shared in the previous post. Jacob had a fun meet n' greet/ramp up day at school yesterday where we turned in his supplies, etc and met his teacher he'll have for preschool and throughout the day on Monday, Wednesday, and Fridays (who is the same wonderful gal as last year) and his childcare teacher that he'll have on Tuesdays and Thursdays (who is expecting in December and will deliver in the new hospital;-). I am going to take Owen into his Childcare on Monday for an acclimation period after dropping Jake off for his first day of school. Then I scoot off to the new hospital to help out with a few things for a few hours before picking up Owen...I thought it would be good to not drop him off in a week for 9 hours solid from day 1 but, I'm sure he would manage either way. I officially start on September 2nd, then we leave at the end of that week for another (don't hate me;-) CRUISE! This one we are going on with my lil' Sis Amanda and her hubby Jason. We'll get to port in the Grand Cayman's and Mexico;-) Then we will travel back so that I can work Friday and the kids can go back to school only having missed 4 days (bad timing;-). Then I have 4 more weeks orientation before the Hospital opens mid-October. On another note: I find this time of year one where I reflect on my past. Right now I'm reflecting on where I was this time 2 years ago...I was on the couch recovering from major surgery (August 10th, 2006) and was only 2 1/2 weeks into bedrest (22+ weeks pregnant) due to high blood pressure (I spent 11 more weeks after this point as well "in bed"). I did not yet know that there was more to come-things more challenging than bedrest alone. I had not yet heard the doctors say things like: there may be a problem. Your unborn son has a malformed head, and his arms and legs and chest are incredibly small. He may not live. It may be Thanatotropic dyslplasia. Or another skeletal dysplasia. There is a 99.9% chance he has some form of dwarfism. There may be Syndromes not compatible with life. Let's do an amnio. And so on. My world was bedrest laden but not all that bad-until Mid-September. It was not until I was 25 weeks along that I heard such terrifying utterings. I think about this story all of the time. Who did that happen to? What a blur. What deep waters I endured. Oh the tears I cried and paths my mind went down-ones a mother should not have to go-but I lived through it. It is my story. I am forever changed because it. What a difference 2 years makes! Oh how in my hopes of hopes and prayers of prayers never would I have imagined we would be here-where we are today. Thank you Merciful Lord for our precious Owen! I did it...I was strong- I didn't cry. I thought I'd bawl my eyes out but I kept my cool and only teared up a tiny bit (and that was during the teacher/principal silly song when Mr. Lambeth mentioned being naughty;-). Anyway, all the boys got up great and did well with pictures until I tried the elusive group picture of all 3 of them...unsuccessful-as usual. As for the end of an era, my last night at Home Hospital was last night. I thought I'd be devastated and really torn up about leaving but, I wasn't...but, I only wasn't because I was able to go spend 2 plus hours with some of my new coworkers on our BEAUTIFUL new unit at the NEW Clarian Arnett Hospital. The place is breath taking and the features of the rooms are OUT OF THIS WORLD! I know patients will LOVE LOVE LOVE the unit and we are all hopeful they will love the care we give them as well. More to come about the new job soon...orientation starts Sept. 2nd. Jake starts preschool Monday. Things are rolling around here;-). 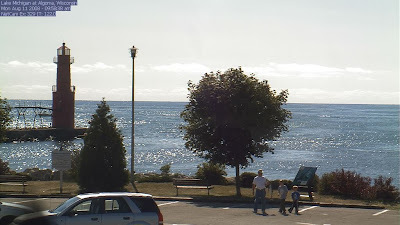 Though I wasn't there, they have a really cool webcam set-up at Algoma that refreshes every 30 seconds or so. They called me to tell me to check it out and I was able to save the photo of TJ's approx 6 pound salmon:-). Owen also got lots of goodies and a cute build a bear doggie. It was a really fun time (all but the traveling part;-). The should be 6 hourish trip would be fine minus one crabby momma, and 3 fighting fussy boys, and endless traffic thru Chicago with highly irritating gun-it/slam on the brakes traffic every 30 seconds-oh which ends in a 7 hour plus trip of misery! Us girls went to get Subway for "all of us" for lunch Sunday on the boat and left all the kids with the guys (G-pa, Uncle Andrew). When we got back all was fine and hours passed before I heard of the "miraculous survival" (not even kidding here) of Owen. They were all on the boat in the cabin area and Owen was playing on the back of the boat (area with fishing poles and all with the sides of the boat up to his head). Well, apparently they found Owen minutes later ON THE DOCK---yes, I repeat, OUT OF THE BOAT, ALONE, ON THE DOCK!!!! Unbeknownst to the guys, Owen must've climbed up over the side and onto the deck which is about a foot away from the side of the boat (picture deadly gap between boat and deck with DEEP water and just enough space for his body to fall in-NEVER to be seen again). Had it been the other side (see photo below) and he would've been in the water. Somehow (God-how), Owen must've climbed out and landed on the deck (which was nearly physically impossible for this tiny kid (Jake can hardly get out of the boat and onto the dock at 40 inches) and was none-the-wiser that he cheated certain death from drowning/injury from a fall. Can you believe it? I could be planning a funeral right now, but instead am sharing how God has spared my baby once again. NONE of us would've ever thought that lil' dude could manuver in such a way that he could get off that boat (in any manner AND survive)...unbelievable. Thank you Lord for delivering Owen to the dock safely and then protecting him while he played on a 3 foot wide deck area with no sides nor railing and water all around him to fall in. These are Owen's feet at the beach...but I wonder-are they or is it really like the footprints poem...did the Lord carry Owen through-I believe He did. And to end this post on a "good/more fun" note...I must tell you all, Owen has some issues lately with when and where he "goes" to the bathroom. At G-ma's he pooed in the tub 3 baths straight...then he peed on her floor. Yes, he IS in diapers but he picks every moment that he ISN'T in a diaper to go (no this does NOT mean he's ready to be potty trained!). So, right before we left, I was busy downstairs so the boys got Owen up out of his crib in the morning. TJ yelled down that Owen didn't have a diaper on and I ran to the stairs (grabbing the camera of course) and was trying to clarify as Owen appeared at the stairway landing and started to pee. So, here's to you Owen-may this haunt you when I use it at your HS graduation, wedding, and so forth forevermore! Happy 21 months Owen Elijah! A neat day and a new toy!